Some cards are just fine the way they are…though I’m not sure that applies to cards that were made a few years ago being brought back into today’s game. Dunsparce is a Basic Colorless Pokemon, 50 HP, with a Fighting Weakness, no Resistance, and a Retreat Cost of 1. Its first attack Strike and Run nabs 3 Basic Pokemon from your deck and puts them straight onto your Bench, and then you can switch Dunsparce with one of your Benched Pokemon. Sudden Flash is then a 1-for-10 with a coin flip for Paralysis. …so guess which attack makes him more interesting. In all honesty, this is probably the single most terrifying set-up move in the game, if only because when they reprinted it, they didn’t give it a clause that excluded Pokemon-EX/GX, meaning you could be nabbing 3 REALLY BIG Pokemon right out of your deck, and before your opponent can do anything, Dunsparce is hiding behind one of them on your Bench. The only way this attack would be more unfair is if Dunsparce went back to the hand or to the deck. That being said, is it worth it? …well obviously. You get a major set-up, you get to thin your deck, you get to switch around your Dunsparce so he’s not immediately exposed outside of a Guzma – he’s just really really good. You might not run Dunsparce in every deck though, and you might not run the full 4-of unless you think you’ll be able to get the first attack and set-up exactly what you need (or you use all 4 in the first Strike and Run and then set-up for the following turn to implement the strategy, though you risk a Prize card at that point), but all things considered, Dunsparce is in a good position right now to push for that major support. Do you play Dunsparce? That’s up to you. But let’s just say that 50 HP isn’t going to be much of an issue. Arora Notealus: Dunsparce doesn’t seem like much, but even in the old days of EX Sandstorm when he came out, he was pretty powerful. Something about bringing out a bunch of Pokemon all at once just seems to be really really good. Go figure, eh? Dunsparce (EX Sandstorm 60/100, SM Celestial Storm 110/168) is one of the few Pokémon that is actually a reprint and not a modernized card due to possessing the same attributes and attack effects copied verbatim from the older copy that was in EX Sandstorm. A modernized card would have stronger attributes like more HP or damage output, but Dunsparce remains the same since day one. A Basic Colorless type with 50 HP, weak to Fighting, and a retreat cost of one, it has two attacks. Strike and Run fetches you three Basic Pokémon and benches them, and you have the option to switch this Pokémon with one of your Benched Pokemon after you fetched them. Sudden Flash does 10 damage and has a 50% chance to paralyze the Defending Pokemon. The older print used to paralyze two Defending Pokémon due to using two active Pokémon back in the 2V2 format, so seems like the attack from the modernized print is nerfed in that regard. This card was reviewed once unless I didn’t look hard enough (due to scrolling down the page without using Ctrl-F) (https://www.pojo.com/dunsparce-pokemon-card-review-cotd/). As of right now, I would run out of things to say because both Otaku and I already covered what we’ve got to say. And those reviews aren’t too dated since we both speculated what it’s viability would be if it was released. I guess I could say that it had gotten a little better for the Standard format due to lack of competition. In Expanded, players will use something similar without using up your attack such as Brigette. Dunsparce (CES 110) squirms its way into the format out of the Celestial Storm expansion set. This Colorless 50 HP Basic Pokemon has two attacks. Strike and Run is GREAT. This card makes you want to go second. I hear youtubers say all the time, “Why would you go second? Going second is terrible.” I even remember one video where a pretty prominent youtuber said that he might as well concede if he didn’t win the coin flip. Granted, that clearly was an exaggeration, but there are PLENTY of Pokemon that will greatly help you out if you get to go second – and Dunsparce might be one of the best of those turn two starter Pokemon. Strike and Run is a fantastic attack, it essentially functions as a Brigette and gives you the extra added bonus of being able to 1) switch into one of your newly benched Pokemon or 2) remain in the active position. I almost always leave it in the active where it functions as a potential sacrifice, but its second attack Sudden Flash has really helped me out a number of times as a potential stalling tactic. The only downside to Dunsparce is that you essentially have a little bit less than a 50% chance of getting it in your opening hand. In my Swampert decks, I actually pair it with Alolan Vulpix. I know, it’s CrAzY having EIGHT tech Pokemon like that, but this almost guarantees that I’ll be able to get a good starting Pokemon so I can get lots of Pokemon in play by attacking on turn two. I can get away with running so many Dunsparce and Vulpix in that deck because of Power Draw – I always need cards to discard to fuel that, and the extra Dunsparce and Vulpix are great Power Draw fodder. If I get to Strike and Run on turn two and Beacon on turn 4, forget about it, you’re in some trouble unless you hit me with a Judge or a Let Loose Marshadow. Dunsparce isn’t great if you run Big Basics, but if you’re running a number of Stage 1 or Stage 2 feature Pokemon, four of these will definitely facilitate your development. Welcome to another week of “runners-up” from our countdown of the best cards of SM – Celestial Storm. In some ways, I think these are more informative than the actual Top 10: at least some of those cards are so good you scarcely need us to inform you of why, but here is where overlooked gems may be put on display. We start the week with what would have been our 16th-place pick if we’d counted down from a high enough number, Dunsparce (EX – Sandstorm 60/100; SM – Celestial Storm 110/168). Dunsparc earned 34 voting points by appearing on two individual reviewers lists, one being my own as my 13th-place pick. It is also our “Throwback” for the week, even though it isn’t Thursday, because it is a reprint of card from 15 years ago! Though there are some wording changes to the effects of the attacks, mechanically they are the same. We actually reviewed the original release of this card for a Throwback Thursday about five months ago, and you can see our original Dunsparce review here. Not that I chimed in on that first one. Dunsparce is a Basic, [C] Pokémon with 50 HP, [F] Weakness, no Resistance, Retreat Cost [C], and two attacks that both only require one of any Energy to use, “Strike and Run” and “Sudden Flash”. 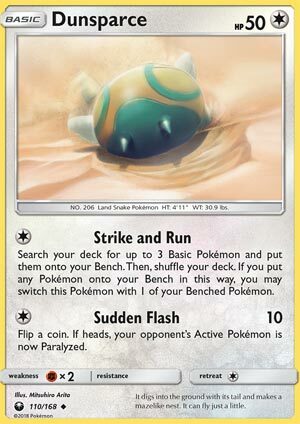 Strike and Run has you search your deck for up to three Pokémon, and so long as you searched out at least one Pokémon, you may then switch Dunsparce with one of Your Benched Pokémon. Sudden Flash simply does 10 damage and has you flip a coin, with “heads” meaning you also Paralyzed the opponent’s Active. Strike and Run used to be the opening attack of the Pokémon TCG, but times were very different. The XY-era introduced a “first turn rule” that prevents the player who goes first from attacking on his or her first turn, the very first turn of the game; but Dunsparce released when this was not the case. If not when Dunsparce first released, shortly after the player who went first didn’t get to draw or use a Supporter on his or her first turn but could still attack. Very few decks had a better use for their opening attack other than using it to set up their side of the field. In the present, Dunsparce is dead weight if you go first. What is worse, I failed to test this card before it came time to review it. I USED Dunsparce a lot, but only in the Theme Format as a single copy can be found in both the “Leaf Charge” and “Hydro Fury” decks, where it is pretty amazing. Yes, even though Leaf Charge has two copies Manectric (SM – Celestial Storm 52/168); going second the deck has three amazing openers, plus the slower pacing means it is only a minor drawback to open with Dunsparce while going first and have it stuck sitting there for a turn. In the Standard or Expanded Formats, that would all but guarantee Dunsparce would be OHKO’d, and it is still possible even in the Theme Format, but quite unlikely. I believe it is safe to assume all of this translates to the Limited Format as well; barring a +39 (or “Mulligan”) build, everything else should benefit from Strike and Run and even Sudden Flash in the Limited Format. Do I have nothing to say about Expanded and Standard? I do, but I wanted to make it clear that this is still Theorymon. Dunsparce should not be run the way it was in the old days, where decks ran multiples to improve the odds of opening with it. Different card pool, different rules; I am thinking decks that can use Dunsparce well in Standard would only want one or two copies. Part of this is because Dunsparce is a waste if you’re going first, but the deck Dunsparce may help the most are Evolution decks that want to go first so they can be the first to Evolve. Dunsparce is the “consolation” Prize; use only one search card on Dunsparce (if it isn’t there already), get it into the Active Position, and save the rest of your search for your Evolutions. Dunsparce can also make your deck a little more Counter Catcher/Counter Energy friendly, and Dunsparce is also decent “bait”. Dunsparce should be neither as important nor as unimportant as it looks; BOTH attacks can be surprisingly helpful even late game. As for Expanded, the same thing applies except decks still have Brigette. There may be a few exceptions which need to grab multiple Basic Pokémon-EX, and/or search out a Basic with a useful “While this Pokémon is Active…” Ability, but even those exceptions are using Dunsparce as insurance against a lack of search and poor draws. So, do I think I was wrong when I ranked Dunsparce as my 13th place pick? I think I was a bit high; I’ve painted a pretty bleak picture but it is important to remember that Dunsparce is a generalist. It is far from an optimal card for most decks, but even if subpar it would be a functional card in them. On top of that, it then shows potential under niche circumstances. Maybe it is just nostalgia speaking, but I really wish Dunsparce had taken at least 15th place. Not higher than 10th place, though; I’m not that optimistic over its chances.